What is Alternative about Alternatives? Investors generally reference “alternatives” as investments that fall outside the two primary asset classes, equities and bonds. These investments can be as vanilla as options and currencies, or far more esoteric, like timber, collateralized debt obligations, or art. The problem with such a broad classification system is many commonplace investment strategies are grouped with obscure asset classes when these strategies have more in common with traditional investments. This is particularly relevant for equity long/short and market neutral strategies. Many sophisticated investors have moved beyond the metric of “alternative vs traditional” when considering equity strategies. Since the securities are the same across portfolios, strategies are differentiated by other metrics, such as risk/reward profiles, net exposures, and volatility profiles. Strategies are selected for criteria like smaller drawdowns and shorter recovery times, higher Sortino ratios, and less downside monthly capture. In fact, the only thing alternative about these strategies is the statistics they post, like having a 50% correlation to the market or a half the volatility of equities. Now, to be clear (and because our compliance team makes us say this), not all alternatives are designed to lower volatility. Many are looking to maximize returns and may be more volatile and risky than traditional investments. Each investment strategy needs to be analyzed on its own merit in the scope of a specific investor’s risk profile and return objectives. But the bigger point is that these strategies allow advisors to tailor a portfolio around a client’s objectives rather than simply fitting the client into one of a handful equity and bond portfolios. 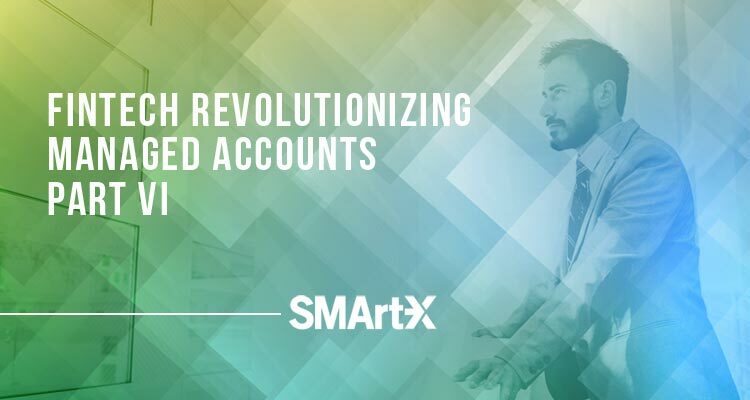 Platforms like SMArtX make it easy to research and allocate to these strategies in the same client brokerage account as traditional and index strategies. Coupled with the power of SS&C Advent, automated account opening, Advisor as a PM, rebalancer, and drift management tools, SMArtX is a complete turnkey asset management platform. ← Can Retail Model Marketplaces Challenge TAMPs for Assets?